Beginning in the late 1940s, visiting the Rich’s Department Store in downtown Atlanta during Christmas was a beloved tradition in Georgia. Rich’s placed a Christmas tree on the roof of its downtown location for the first time in 1948. The tree stood seventy five feet tall on the store’s crystal bridge over Forsyth Street. 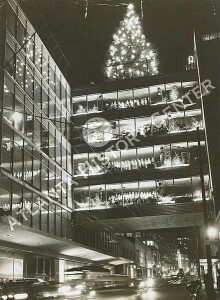 The lighting of Rich’s Great Tree on Thanksgiving night became a tradition in the years that followed (see right, 1949). 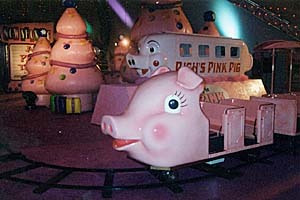 In 1953, the store introduced its famous “Pink Pig.” This children’s train ride originally rose above the toy department and featured a Priscilla the Pig train car, but was later moved to the roof, where it circled the Great Tree. After the ride, each child was given a “I Rode The Pink Pig” sticker. Beginning in 1960, children could visit Santa’s Secret Shop on the fifth floor. The shop allowed them to pick out inexpensive gifts for their parents in secret, because adults were not allowed in. Visitors also frequented the store’s Magnolia Room restaurant, which was famous for its chicken salad and cheese straws. The downtown Rich’s store closed in the early 1990s and the tree was temporarily relocated. Since 1999, Macy’s has held the Great Tree lighting ceremony on Thanksgiving night each year at their Lenox Square location in Buckhead. In 2003, the store introduced a new Priscilla the Pig, which continues to bring children joy during the holiday season (credit bryan : source). The original Priscilla is still around as part of the Christmas decor. To read more about the Rich’s Christmas experience, take a look at I Rode the Pink Pig: Atlanta’s Favorite Christmas Tradition, published by Hill Street Press with Rich’s-Macy’s in 2004. The Rich’s Great Tree was also featured on the cover of Time Magazine on December 15, 1961. I remember riding the Pink Pig when I was a child. It went over Toyland and was so magical. My grandmother worked at Rich’s so we would always shop there! I took my daughter to ride it the last time it was at Rich’s and I didn’t remember it being so small!!! That book is great too! I’m sure that everyone who experienced this has wonderful memories! The imitation at Lenox is a travesty! nd give Santa Claus a List for him to bring to us, and after that we would ride the pink piggy and have a fun time. I think I speak for everyone who lived in Atlanta during the heyday of Rich’s that Rich’s was Christmas. The weeks to follow seemed so long and slow but always a festive and memorable time thanks to Rich’s. The magic began outside in the store windows. My favorite windows were the golden bells of all shapes and sizes moving back and forth against the red velvet backdrop. I remember the first time riding the Pink Pig when the monorail traveled above the toy department. Years later the move to the roof top was most welcomed because we had a close-up view of that magnificent tree, the Christmas village below the monorail, eight live reindeer in queue to Santa’s throne where we not only gave Santa our Christmas wishes but also rewarded with a large green Christmas Tree shaped gumdrop. Then the there was the trip to The Secret Shop where I purchased simple, but loving, gifts for mom and dad. Last but not least, the taste of Rich’s coconut cake after Christmas dinner. Thank you, Rich’s for all the wonderful Christmas memories. As a child in the 40’s my mother and sister took e to Rich’s to see the Lone Ranger and Tonto, the real ones and he gave me a silver bullit. It would have been in the middle 40’s. Does anyone else remember or went to this event? I have such fond memories of this as a child and I wore my sticker with pride! 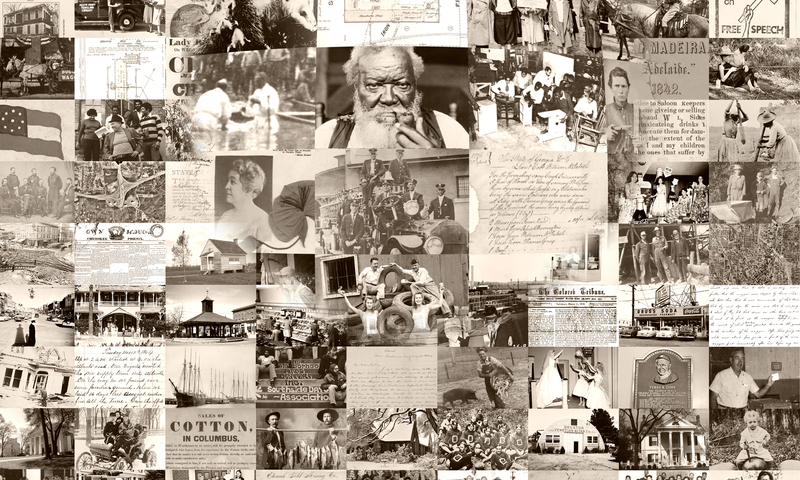 Is the Rich’s coconut cake recipe still available? If so I would love to have a copy.